We’ll be gone for a few days while Mom & Dad are off visiting the Popstar. But we’ll be back! It’s been a long 3 weeks since I’ve been around (not that I’ve been having fun or anything), but things are getting back to normal at my house—finally! Mom’s knee is healing and the blood clot is (hopefully) under control. I’ve gotten a wonderfully long walk each day from the bestest petsitter in the whole world and some of my favorite bi-peds have taken me on a few outings where I can run. Mud always means a nice roll in the dirt afterwards. How else is a dog supposed to clean off? There’s nothing like a good roll after wallowing in a mud hole. Then off we went to the Sandy River where I found a ball! I even shared with Heidi. She likes to play keep-away. We ran and played and ran and played. Mom started taking me for walks yesterday and she whispered to me that we are going to see Mr. N this week for a new adventure! I can’t wait!! Mr. N and I met up out at 1000 acres–it was more like 10,000 puddles, but who’s counting? After all, this is Portland! Oh, and I also had a mani-pedi. Check it out! It was a very windy day out at 1000 acres as I sat waiting. And then… here he came–Mr. 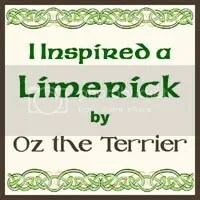 N of Tenacious Little Terrier! What a cute little guy. I decided I had to be on my best behavior and show Mr. N how much fun this place can be. We went on a long hike through the woods and down the path, trying to stay out of the wind. I ran and Mr. N stayed right with me–he’s quite the little trooper and became my cheering squad when I got hot and had to hit the nearest mud puddle (of course, you say). Somewhere along the way, a wild rose branch got stuck in my furs–it was not fun with all those stickers on it, let me tell you. I worked on one end of the branch and Mr. N pulled on the other. And, we did it–I’ll have Mr. N on my team any day! I do have to confess that in my zeal to really awe Mr. N and his Mom with my excellent behavior, I found some extra special eau de stink to roll in. I did want to make a good impression, you know. I just don’t know why Mom kept saying “don’t get too close to Sage”. At least I was able to dab a bit around my neck–I understand that’s where eau de stink goes. Thanks for joining us Mr. N and his Mom! We hope to do it again.